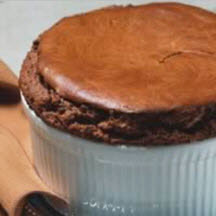 This melt-in-you-mouth, luscious chocolate soufflé is sure to impress and please. In covered jar or blender container, shake or blend together milk, 1/4 cup of the sugar, cocoa, flour and salt, if desired. Pour into a medium saucepan over medium heat, cook, stirring constantly, until mixture boils and is smooth and thickened. Stir in vanilla. Set aside. In large mixing bowl at high speed, beat egg whites with cream of tartar until foamy. Add remaining sugar, 2 tablespoons at a time, beating constantly until sugar is dissolved and whites are glossy and stand in soft peaks. (Rub just a bit of meringue between thumb and forefinger to feel if sugar is dissolved.) Stir egg yolks into reserved sauce until well blended. Gently, but thoroughly, fold yolk mixture into whites. Carefully pour into 1 1/2 to 2-quart soufflé dish or staight-sided casserole. Bake in preheated 350°F (175°C) oven until puffy, delicately browned and soufflé shakes slightly when oven rack is gently moved back and forth, about 30 to 40 minutes. Serve immediately. Recipe and photograph provided courtesy of the American Egg Board.